Crowds gather in Vatican City on Sundays at Noon to pray the Angelus prayer with the Pope. Often the Pontiff will make brief remarks in conjunction with praying this ancient Christian devotion to the Incarnation. 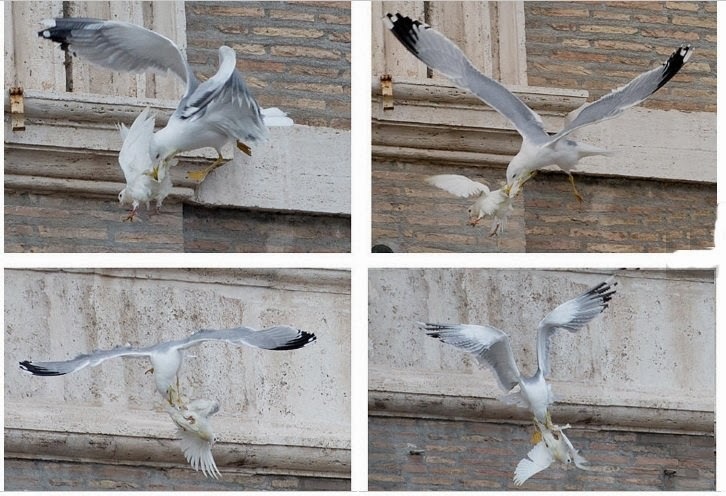 However, those who sojourned to St. Peter’s Square this Sunday saw quite an unusual spectacle. 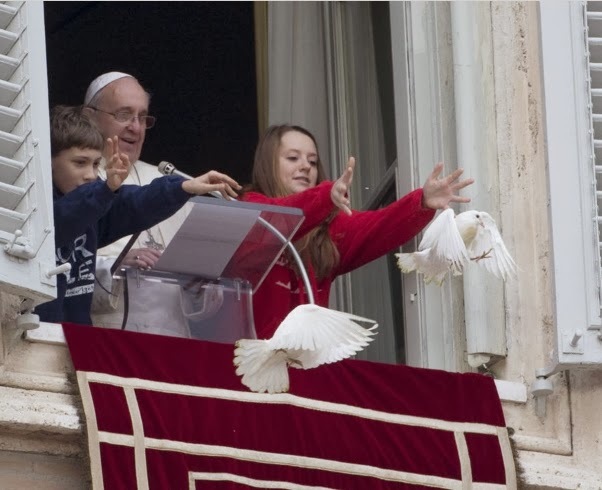 Pope Francis stood on the balcony of the Apostolic Palace and was flanked by a boy and a girl who released doves into the air. This international symbol of piece should have served a dual purpose, marking the end of the Octave of Christian Unity as well as underlining the Pope’s call for peace. Pope Francis focused on the bloody unrest in Ukraine, where he called for “constructive dialogue” to prevail in the Eastern European nation. Alas, an unruly aviary altercation took the world’s attention. After the two white doves took flight, a seagull and a large black crow swooped down on the doves immediately after they were released. While one dove lost some feathers when it broke free from the gull, the other dove was repeatedly pecked by the crow. Some wags have suggested the faith of the black bird might have been from The Religion of Pieces, but that remains unsubstantiated. While it was rather ironic that symbols of peace seemed under attack as they were released to the world, it would be wise not to ruminate on this grotesquerie in order to consider the call for peace in Ukraine.